The Denver Broncos final game of the year was far from meaningless as the Los Angeles Chargers come to Denver to finish the year. While both teams are headed in completely different directions after the game, Denver is looking to grow young talent for next year and immediately saw flashes. Rookie Isaac Yiadom intercepted a Phillip Rivers pass on the Charger first drive of the game. 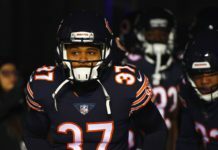 It was the rookie’s first career-INT in a year full of inconsistent play, but certainly can be forgiven as a rookie cornerback thrown into the fire of constant play due to so many secondary injuries. Denver’s most depleted position this year was cornerback and a complete revamp of the secondary room is expected in the off season. The defense once again stood tall towards the end of the first quarter. Will Parks who may be in line for a full-time role in 2019 intercepted a Rivers pass and the defense pitched a shut-out in the first half. However, the Broncos offense was a disaster to say the least. Denver recorded 43 plays in the first half on offense and average 4.5 yards-per-play. 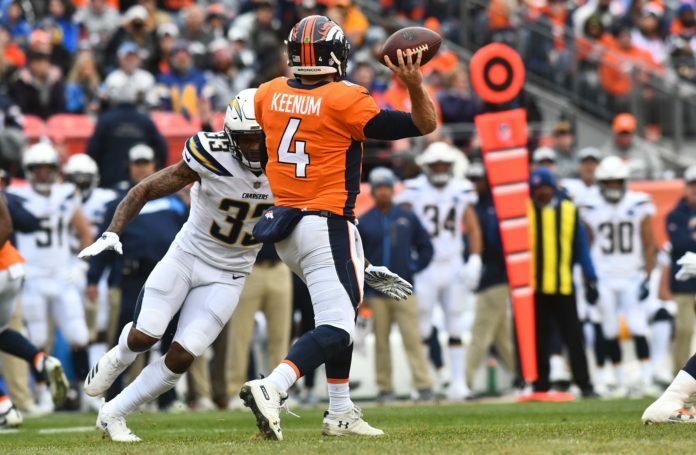 The Broncos offense made a major gaffe when Case Keenum threw a backwards pass that was fumbled and returned for a touchdown by the Chargers Kyle Emanuel, which stood as the only touchdown of the first half. 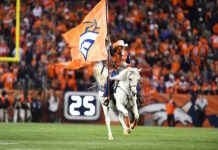 This after Denver was placed in a first-and-30 situation when four holding penalties on the drive pushed the Broncos back, including nullifying a long touchdown run by Devontae Booker. Denver drove the field on their next possession before a wacky sequence involved Keenum throwing an interception in the end zone, which was returned by Chargers safety Jahleel Addai, before Addai attempted to lateral the ball to a teammate, which was fumbled and recovered by the Broncos at the Chargers 20. Denver cashed in that opportunity with a cheap-shot 28-yard field goal. At the conclusion of the first half, Denver was called for seven penalties for 65 yards. 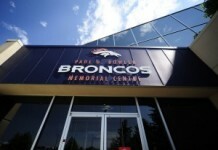 Colby Wadman recorded most of the work for the Broncos, punting four times for a 44.8 yard average with a 55-yard punt. River Cracraft was the Broncos leading receiver in the first half, catching a 44-yard pass from Case Keenum to lead the Broncos in yards at halftime.